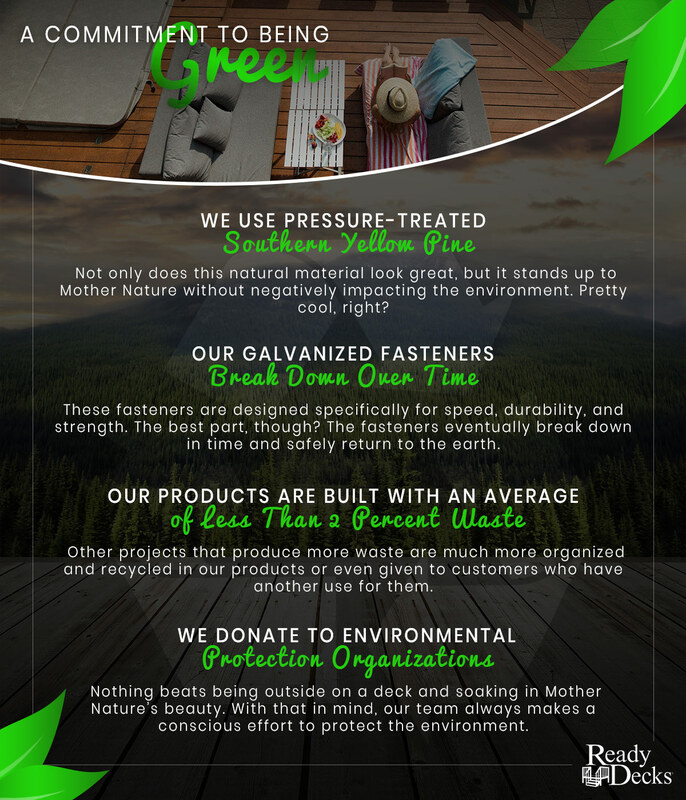 Is an Eco-Friendly Deck Right for Your Home? Decks have skyrocketed in popularity. It’s no surprise, either, when you consider the fact that well-designed decks serve as an ideal outdoor gathering space. Now for the million dollar question: how do you build a deck without impacting the environment? Keep reading as we look at eco-friendly deck materials, designs, maintenance, and more. Natural wood – This might seem like the most obvious choice. Not only is wood a renewable resource, but it’s also visually appealing. The one downside to natural wood is that’s not pressure-treated to withstand extra moisture or insects. We recommend looking into hardwoods if you want a wood deck structure that will last for years to come. Pressure-treated lumber – Here at Ready Decks, we only use premium-grade, treated lumber. There are seemingly countless benefits to using this material. For one thing, pressure-treated lumber is easy to find and won’t cost an arm and a leg. Another plus to using treated wood is that it resists rot and insects. Composite material – Some homeowners prefer composite material when building their decks because of its low maintenance features. Here’s the thing: composite deck boards are constructed from a mixture of recycled plastic and wood particles. It’s important to note that composite material withstands inclement weather and regular foot traffic better than wood. However, there are several drawbacks to using this material. Unfortunately, the blend of organic and non-organic materials that make up this product are by no means eco-friendly. Now that you have a general idea of “green” deck materials, let’s take a look at some design aspects. If you really want to keep the structurer’s footprint to a minimum, mark where you want to install the vertical supports and dig individual holes as opposed to a large pit. Another consideration here is to build your deck to face south of where your home is located. Doing so will help cut down on excess heat during the hotter months of the year. Of course, feel free to construct your deck around any trees to provide additional shade. 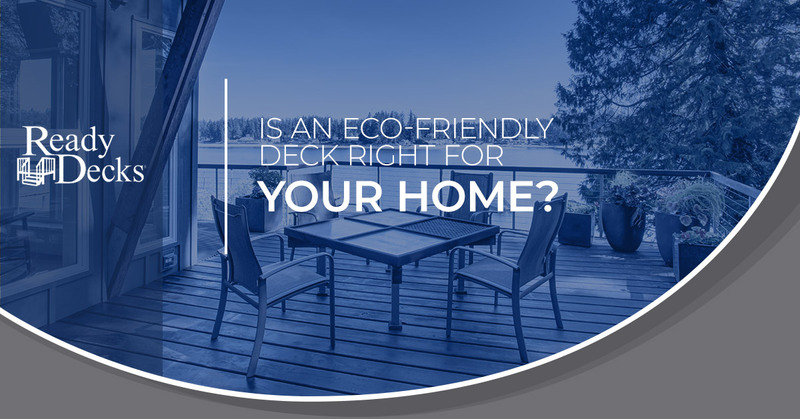 You went out of your way to purchase eco-friendly deck materials and come up with an eco-friendly design. So then why would you want to waste your efforts by cleaning the structure with dangerous chemicals? Our deck builder recommends using a more “green” solution such as oxygen bleach. There are many reliable deck contractors out there. But how do you know which is best for your project? For nearly two decades, the Ready Decks team has been providing homeowners the highest quality decks in the shortest time possible. Thanks to the patent-pending building system at Ready Decks, you can enjoy an incredible value for your investment. By no means will you have to worry about a product that breaks down in just a few years. Customers would agree that our decks look better and last longer than just about any other product in the industry today. Whether you’re interested in premade decks, prefab decks, or mobile home decks for sale, Ready Decks has you covered. Get in touch with us today.